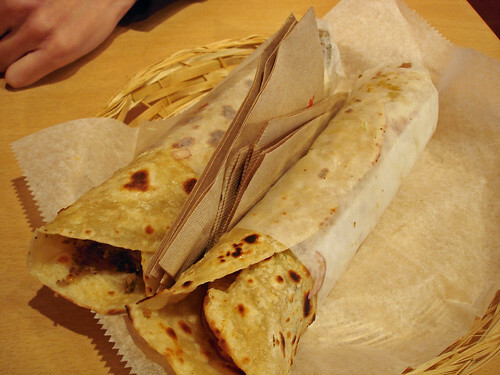 The Kati Roll Company (KRC)  is a New York chain of restaurants offering Indian wraps based on a street food originating from Kolkata in India . 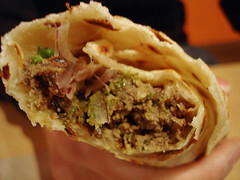 A kati roll is defined as a flatbread wrapping a mixture of spiced meat and vegetables. Mooli’s is a recent addition to Frith Street and also offers Indian wraps. While Mooli’s has recently been making news in the blogs, coverage of KRC has been more quiet. The aim of this paper is to compare the Indian wraps offered in London’s Soho. Samples of Indian wraps from both KRC and Mooli’s were obtained and compared. The results of the comparative analysis of the wraps are presented here. The paper concludes with a discussion of both rolls and restaurants. Samples were obtained from KRC at 13:00 on 24 December, 2009. 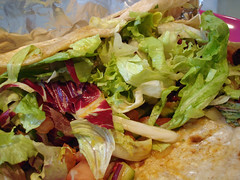 A chicken tikka roll and a shami kebab roll (comprised of spiced minced lamb) were procured as representative examples of the genre. The two rolls were shared equally between the two researchers and eaten on the premises. Figure 1 shows the rolls purchased. Figure 1. A chicken tikka roll and a shami kebab roll from KRC. A sample was obtained from Mooli’s at 14:00 on 24 December, 2009. As the lunch special seemed to be a good deal, this was purchased. A Goan pork with pomegranate salsa mooli, roasted papads with tomato chutney, and two lime and mint drinks were obtained. This was split equally between the two researchers and consumed on the premises. Figure 2 shows the Mooli’s roll. Figure 2. A Goan pork wrap from Mooli’s. The preparation and presentation of the wraps, flavour of the wraps, restaurant environments, service, and price were analysed and compared for each location. A comparison of the wraps procured and tasted is presented in Table 1. With respects to size, the KRC roll was described as being a perfect snack size (two for a meal) while the Mooli’s roll was enough for a meal. Table 1. A comparison of the wraps from both restaurants. The KRC rolls were chock full of meat and in the case of the chicken tikka roll, a bit of onion too. The Mooli’s roll was as big as a fast food burrito but mainly contained a lot of salad (lettuce, cucumber, tomato). Figure 3 illustrates the cross sections of the KRC rolls while Figure 4 shows the innards of the Mooli’s roll. Figure 3. 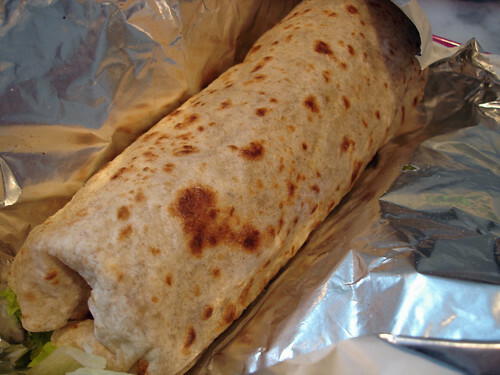 Cross sections of the KRC rolls: (left) chicken tikka and (right) shami kebab. Figure 4. Inside the Mooli’s roll. The walls of KRC were filled with Bollywood film posters and the restaurant itself was filled with low tables with stools. Ordering was done at the small counter at the back. A drinks fridge was positioned on the left hand side and was filled with all the usual soft drinks. Mooli’s looked newer, with colourful postcards scattered everywhere and flat screens displaying their menu. Seating was at counters along the sides or at a few regular tables in the centre. Again, ordering was done at the counter at the back. Service was found to be excellent at both restaurants. The women at the counters were happy to explain the ideas behind the wraps and the flavours within too. At Mooli’s, the researchers were offered complimentary chai teas, after their meal, which were accepted. The KRC chicken tikka roll was priced at £3.25 for one (two for £6.00). 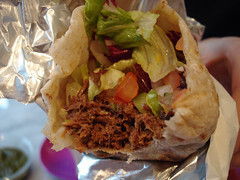 The KRC shami kebab roll was priced at £3.75 for one (two for £7.00). 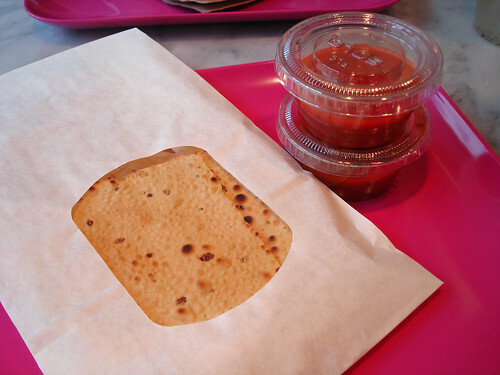 The Mooli’s lunch special deal was priced at £5.00 for the roll, roasted papads with tomato chutney, and a soft drink. The roll can be bought individually at £3.95. The extra lime and mint juice drink was obtained for £2.00. The prices of all the rolls at both locations is summed up in Table 2. Table 2. Mean and standard deviation of the roll prices at both KRC and Mooli’s. KRC offers delicious kati rolls with nicely spiced fillings. There is a wide variety of fillings, with all of them available with a spicy egg omelette also. However, while the price of a single roll is reasonable, one requires at least two to fill up, making KRC the more expensive option. As well, there are no interesting drinks (except for chai) nor are there any side dishes available. A few sandwiches with Indian fillings are offered. Mooli’s strength lies in their satellite offerings: their roasted papads were good and crunchy (Figure 5), the juice drinks excellent (lassis are also available), desserts are offered, as well as a number of sauces for the wraps. Their wraps are very healthy but require more spice in the filling. Apart from wraps, they also offer a no-carbohydrate version as a salad. Figure 5. Roasted papads with tomato chutney from Mooli’s. To conclude, the researchers favoured the KRC kati rolls but Mooli’s wraps are not to be dismissed. The former is more of a treat with its fried bread but the latter is healthier and more suited to everyday lunching. The Kati Roll Company, 24 Poland Street, London, W1F 8QL. Mooli’s, 50 Frith Street, London, W1D 4SQ. * Yeah, my brother and I have matching names and they did make for some confusing moments growing up! And we’re both quite nerdy and we wrote this post together for a laugh during the Christmas holidays. Haha, this is great. Really enjoyable read, good concept and a fair comparison. I prefer Mooli’s myself, but KRC isn’t bad. Both worth a go at lunch time in Soho, for sure. I’ve not tried either but I’m inclined to favour the kati company just because moolis still sound like white radish to me. Ooh how fun, love your dissertation paper approach! Too cute! Now I must get a wrap for lunch! Healthy eating is overrated ! I’ve tried Mooli’s but will now check out KRC – after all it does have 90% meat content ! I thought you wrote ‘KFC’ at first; do they do wraps? These look similar to the Greek ‘giros’ (often imitated, never quite duplicated by non-Greeks)Maybe it’s the same with these? Love the approach using quantitative deduction (or was it qualitative?). You’ve managed to put me off Mooli’s and as for healthy eating- Bah! Humbug! Excellent work- though I do note that you have not declared your funding source or any conflicts of interest! But glad it’s open access! I still remember the egg roll I had in Calcutta when I was about 8 years old, and sometimes attempt to recreate this at home. Might check out the KRC option when I’m next in London to compare! Good comparison work here. It’s a serious job and someone’s got to do it, so I’m glad you’ve picked up the gauntlet. I think the KRC one’s look more appealing, but the price is better on the Mooli. So i reckon I’d go for Mooli for lunch, but KRC if I’m on a night out. It looks more meaty and would definitely go better after a good beer. Why didn’t you order the same type of wrap (ie. Chicken Tikka) from both places? haha, this was great. Really liked the way you broke it down. It’s also cool to see you have the same chain in London! Ouch bad memories of reading research papers have come flooding back x_x Nice analysis of not just the food, but the other aspects too. You didn’t happen to pick up a science degree of some sort at Imperial did you? If all that you say is true, why is Moolis, soho getting such excellent reviews from those who have eaten there? Ibzo: 😀 I thought it would be interesting to write this as KRC doesn’t seem to get a look in with the London bloggers! meemalee: 😛 I am most definitely a nerd. I know what you mean about the name Mooli – thought it had something to do with the radish at first too! ivan: 😀 I’m having a deconstructed wrap for dinner tonight! Parathas and curry. Mr Noodles: 😀 Hope you like it! travelrat: Sadly, you can also go to a KFC and get wraps! Gyros are gorgeous but really different to these. Fat Les: Both! Tried to incorporate the quantitative measurements in the tables. Do give Mooli’s a go though… (but yeah, it’s hard to resist the parathas at KRC). The authors are self funded and declare no conflicts of interest. That should do it. 😀 Now I definitely want to try an egg roll at KRC next time! The Grubworm: I think that’s a perfect way to think of the two. Lunchtime healthiness at Mooli’s and nighttime indulgence at KRC! Matt: Good question. It’s because the pork was calling out to us more. Of course, if I had wanted to be more strict then I definitely would have stuck to the chicken! Danny: I just happened to pass KRC one day and was like, hey! I remember reading about this place on the NYC blogs. weird! An American in London: Oooh, I quite liked the ones I got here which must mean that the NYC ones are superb! Helen: I know! After I posted it I thought, am I insane?! annie: OK… I’m not really getting your question. Obviously what I write on my blog is my opinion. Likewise, what other people write are their opinions. Not everyone has to like the same thing. a very fair comparison, Su-Lin. i enjoyed reading your post, even though i havent been to either place. this is now inspiring me to do a post on a kati roll! enjoyed reading your post a lot. Great post! love the geekiness of it. Thanks for the piece! Moolis is on my wishlist and after reading this I may have to go there sooner than planned. shayma: Oh, I’d love to read your take on a kati roll! Dainee: Oh yeah, they’ve been doing some goat mooli promotion recently too? Nice geekiness. Really enjoyed it. Both sound pretty good. Hope you get given a good mark. The Kati paratha just looks so much more appetising! I must wander over to Poland St.
Foodycat: It’s that fried bread, isn’t it? What a great format! I could read an entire blog of mini studies. Loved your analysis! I haven’t tried Mooli yet, but KRC is really good. The one in New York is much better but the one is London is not bad at all. 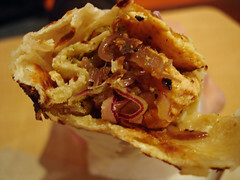 And it comes very close to the wraps I have tried in Calcutta, India. eatingplaces: Hehe…it would be an academic journal blog! Nikita: That’s really good to know. Even if they weren’t completely authentic, they were still very very tasty! Fantastic post. I love KRC! haven’t tried mooli roll but i’m much more into eating a really unhealthy but super tasty roll once in a while than a really healthy but bland roll regularly. Mooli’s rolls are mostly veg — hence can be made for cheap. But KRC, as you said, is 90% meat — hence they are packing more expensive ingredients in for a mere few pence more! I think KRC really deserves credit for that. Also, I think KRC deserves credit for serving a variety of traditional-style kati rolls — while making them accessible for people of different food restrictions. Mooli on the other hand caters to a much more yuppy fusion crowd. I also had the chance to chat to the staff there, and apparently Kati Roll Company, unlike Mooli and others, could not afford to hire a food publicist. So they really rely on word of mouth. A lot of these other restaurants, even small ones, hire publicists not just to inform major media, but also to tip off bloggers. KRC has done none of this, yet they’re still doing well. Hats off to them for that! My only suggestion for KRC would be that they should develop some “mini rolls” as quick options. very interesting comparison, there’s a new kathi place opened in the city called Cafe Kaati. Maybe it would be better to compare KRC with them, as they also are doing authentic styled wraps. Shmii: I’m craving a kati roll now!!! I’m going to have to agree with you regarding a wonderfully unhealthy roll less often. Soni: True, it is pretty obvious that KRC don’t have a publicist. Everyone and their dog are talking about Moolis over on Twitter! It’s a real shame that KRC isn’t known more – their stuff is delicious! KRC is not closed on weekends. I just ate there on a Saturday. But someone should start a Twitter pro bono campaign on their behalf. Never knew what a kati roll was and I just notice Mooli’s the other day. Great to find new types of fast food that is tasty and not overly expensive. Will now go and explore. Thanks for that. Great round up, I’m glad that they’re both there. Variety is the spice of life..
Soni: No, KRC is not. Thank goodness! 😀 My brother and I were recently there a couple Sundays ago; unfortunately, I had an upset tummy so could only taste a nibble of his roll – it was so delicious! Josie: Soho is great for this kind of food! Rich: Can’t wait for your post to see your opinions of them both!